Swirls and twirls abound at ARTafterDARK—inspired by the Bollywood Film Festival. 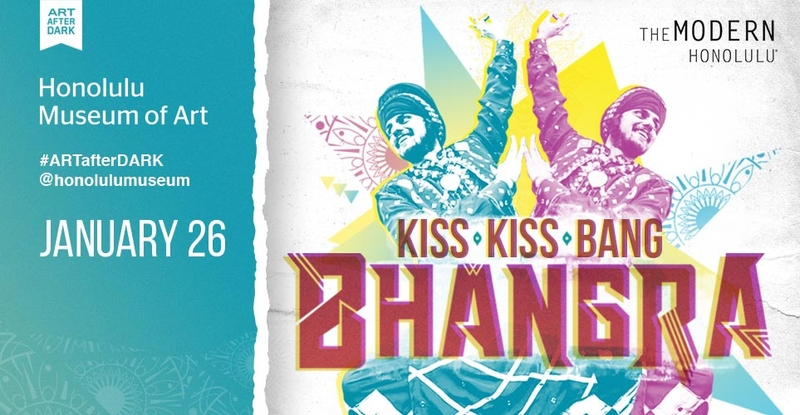 Get your Bhangra on! Become a museum member at the Supporting ($100) level or higher for a chance to win a one-night stay in an Ocean View Room at THE MODERN HONOLULU; dinner for two at RAVISH; a luxury daybed experience; and breakfast for two at The Grove. To enter, guests must join or renew anytime between Jan 12 and the end of ARTafterDARK on Jan 26. Existing Basic ($30) level members may enter by upgrading their membership to the Supporting level or higher. The winner will be notified on Feb 9 by phone or email. • Aaja Nachle kicks it up a notch with a high-energy dance performance in the Kinau Courtyard, then teaches guests some Bhangra basics! • DJ Mr. Nick keeps the Bollywood hits spinning all night long in the Luce Courtyard. • Get your henna on in the Palm Courtyard (pun not intended) courtesy of Hau`oli Henna and Touch of Henna Hawai`i. • Pick up an authentic bhindi from the HoMA Shop! The finishing touch on your ARTafterDARK finery. • A Bollywood-inspired photo booth—take your photo and enter to win a RAVISH-ing experience! • This month's specialty cocktail is a Lemongrass and Hibiscus Collins with Bombay East Gin. THE MODERN HONOLULU keeps the party going at their nightclub, Addiction. Everyone wearing the neon green wristbands from ARTafterDARK will get in free for the official ARTafterDARK afterparty. Show off those Bhangra moves you learned!